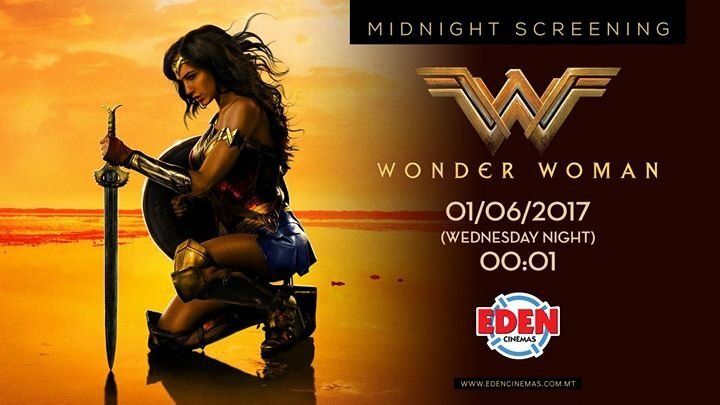 This June, be the first to watch the anticipated superhero movie Wonder Woman at Eden Cinemas’ special midnight screening on Thursday 1st June at 00.01am (Wednesday night/Thursday morning). Director Patty Jenkins’ hotly anticipated movie starring Gal Gadot will be hitting Eden Cinemas’ theatres telling the story of the idolised DC comic character Wonder Woman. Before she was Wonder Woman she was Diana, princess of the Amazons, trained warrior. When a pilot crashes and tells of conflict in the outside world, she leaves home to fight a war to end all wars, discovering her full powers and true destiny. Buy your tickets at www.edencinemas.com.mt for a night of Wonder, Power and Courage.